I am a huge sucker for crepes. Sweet or savoury, cold or hot, I want to try them all. Planning my Eating-Day (yes, it's a thing. ), I skimmed for a lengthy amount of time for a dessert place to chow near by The Annex area. Millie Creperie particularly caught my eye because it was Japanese, situated in Kensington... and beautifully presented! To Jelly Modern Doughnuts, then to Millie Creperie, and then our last stop at Form Lounge. The only crepes I've trialed in my life were all French, there were my own breakfast ones (which I made excessively throughout my first few months of having to cook for myself), an awkward-bouquet-looking-and-terrible-tasting Crepe topped with Sausage, Processed Cheese and drizzled with an off-tasting Mayonnaise at Crispy Crepe in 2011 at Cabramatta (pic) annnd lastly, a delicious Cheesy sampler from Crepes-a-Go-Go who was vendoring at Queen West Art Crawl. 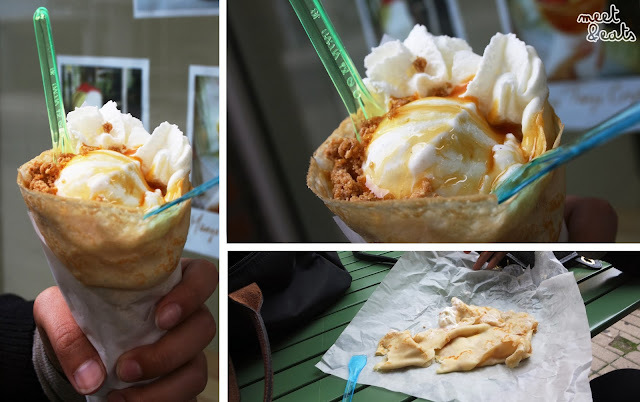 I've scrolled through many Instagram shots of Japanese Crepes and have always wanted to try them for myself. It was the perfect weather to prance around, and only a tad chilly. 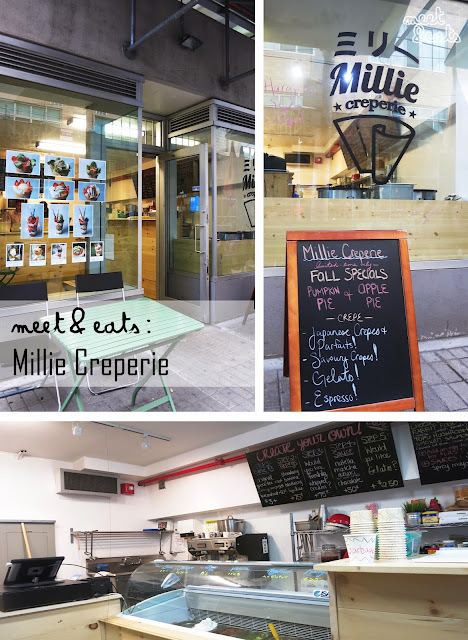 After a waste of calories at Jelly Modern Doughnuts, we headed off to Millie Creperie, a 20 minute walk down and into Kensington, which worked out well at the end. Our eyes wandered along the name-less digital prints stuck along the left window of the store as we proceeded inside. We were happily greeted and cheerfully sampled their Hazelnut and Mango gelatos. Both were amazing, words can't even explain. All of their gelatos are made off-site, which is awesome to know, as I'm that much more appreciative of how spot-on they got the delicious flavours. I will be coming back here each time just to have their gelato. There is indoor and outdoor seating, with two tables outside. 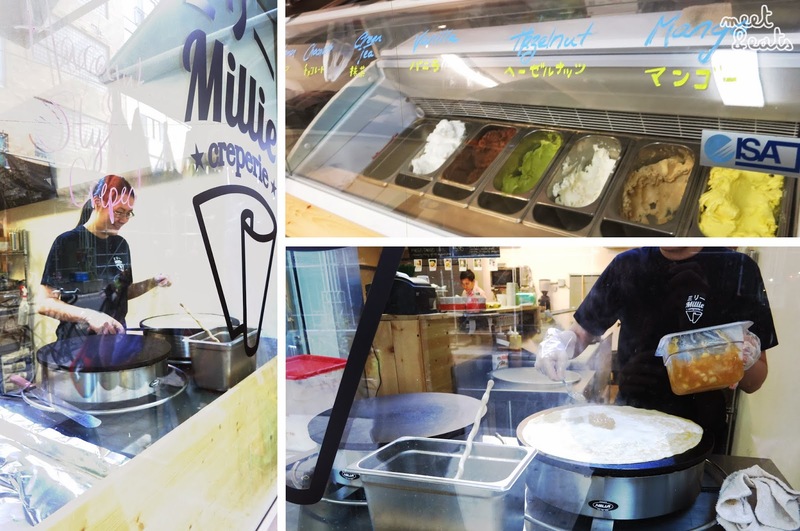 They also serve up savoury crepes, much like the fillings in sandwiches - with spinach leaves, smoked salmon and tomatoes. I didn't have a long look at it, I was just mainly amused by the pocky sticks coming with the parfaits. Filled with Vanilla Gelato, Warm Apple Pie, Whipped Cream, lined in Graham Crumble and a drizzle of Caramel sauce. This was so. so. so. so. good. Now I just wish that I didn't have to share it! I was hesitant and tempted to substitute the Vanilla for a scoop of Hazelnut gelato... but no regrets, the Vanilla gelato was perfect. We didn't have warm Apple Pie as per the description, but I didn't mind. Our hands were so sticky by the end of it and we winded up having to use the wax paper it came with as a plate like little scavengers. Chowing it all down, peel by peel on the patio. The glares of passer-byers was amusing. Wonderful service, and they have a stamp card! Darlings, you have just made yourself a best friend (during the warmer seasons, though). My only downside is that it's a bit too expensive for how tinnnnyyy it is. I hardly felt affected by sharing the one. I can't wait for the warmer weather to kick in... But we have a long way to go! I will come back and try all of their other gelatos.